My wife and I had just attended a Sunday afternoon event in Chestnut Hill, PA. We decided on an early dinner and almost chose Mica’s in Chestnut Hill, a place we have long wanted to try. We passed on it and decided to visit a place closer to our home. 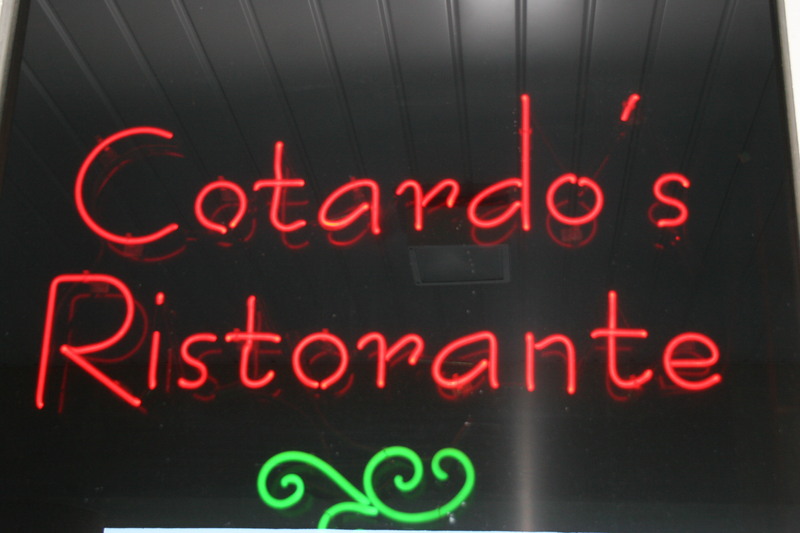 Cotardo’s in Blackwood, NJ is a dining spot we have been to many times but, for some unknown reason, we had not been back there in a few years. It wasn’t quite five o’clock when we arrived so there were plenty of tables available. We were seated and our server, Tara, introduced herself and opened the bottle of wine I had brought with me. 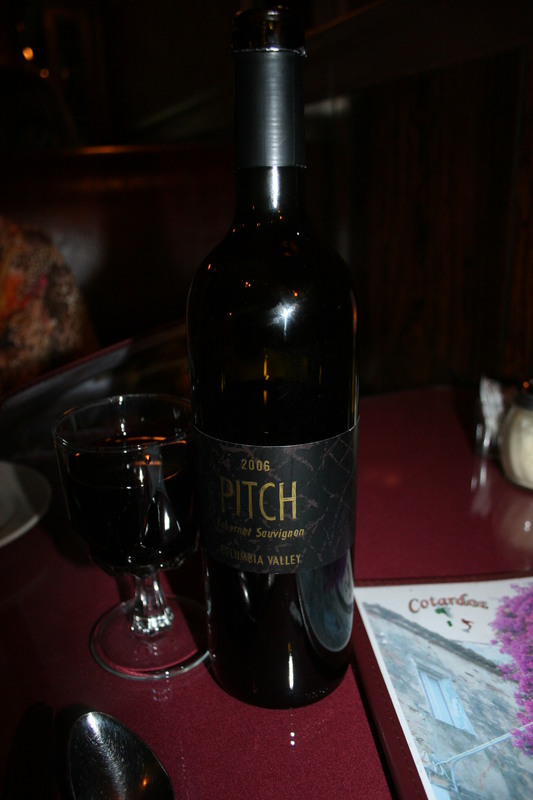 My wine was the 2006 Pitch, Cabernet Sauvignon, Columbia Valley, Washington. Like most local Italian restaurants, the stems at Cotardo’s leave something to be desired but since so few local eateries seem to offer great wine glasses, I’m not going to kill them for that. This isn’t a cab that is going to blow you away but with a $15.00 price tag and enough bright fruit flavors to marry well with most pasta dishes it was fine for the occasion. Cotardo’s has a nice menu with lots of entrees that sound tempting. Almost all of the choices come with soup and salad and hefty portions of their very tasty garlic bread. Kathy and I quickly went through the first four pieces with our Pasta Fagioli. Tara was nice enough to bring us another basket that appeared to have twice as many pieces as the first one. We refrained from stuffing ourselves with the bread and finished our soup. 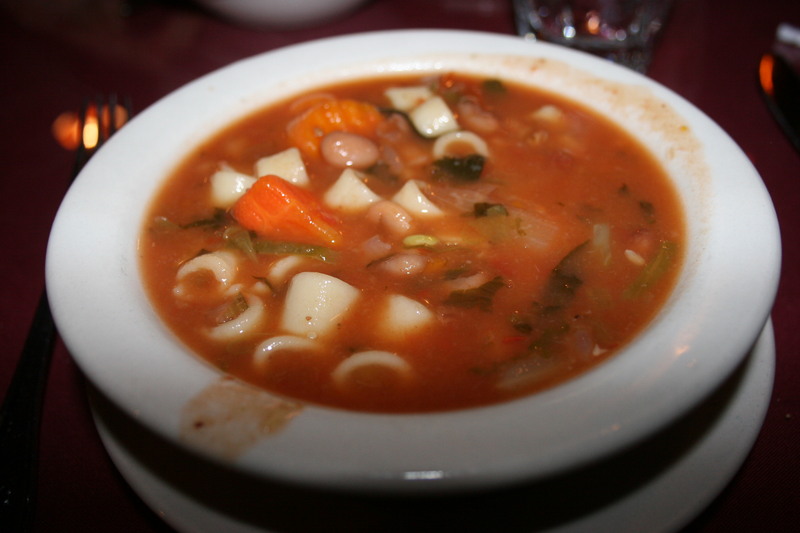 As I mentioned to my wife at the time, Pasta Fagioli is probably not a soup I would order very often but when served as part of the meal it was a perfect starter. The salad was also quite acceptable. Nothing spectacular, but the house salad featured crisp lettuce, radicchio and tomatoes and my ranch dressing blended well with the greens. So far, so good. Soup hot and flavorful, salad fresh and tangy. Great hope for the entree coming soon. 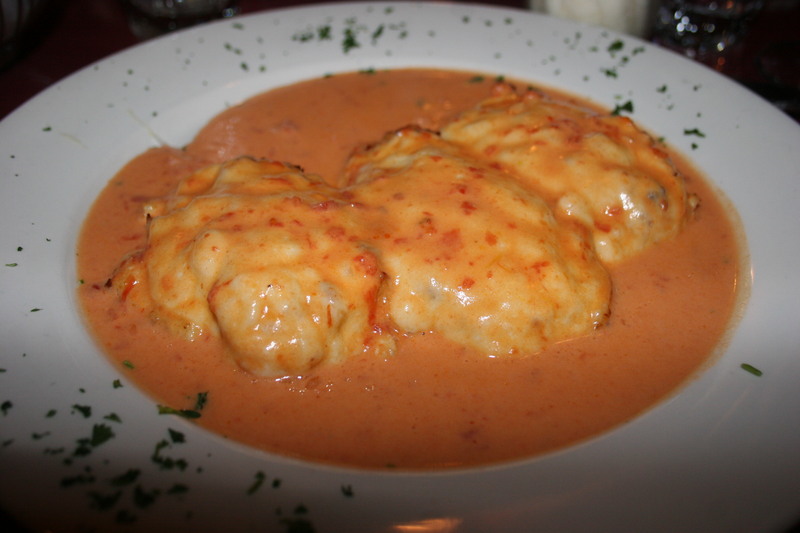 Breast of chicken with crabmeat and melted provolone cheese, topped with a light blush sauce. Ahhhh, good choice! Three nicely done pieces of tender chicken breast swimming in a delicious blush sauce and lots of gooey cheese crowning the meat. I finished about half of it and took the rest home for a Monday evening dinner. The meal was accompanied by a dish of cappelini which was the right compliment for the chicken. 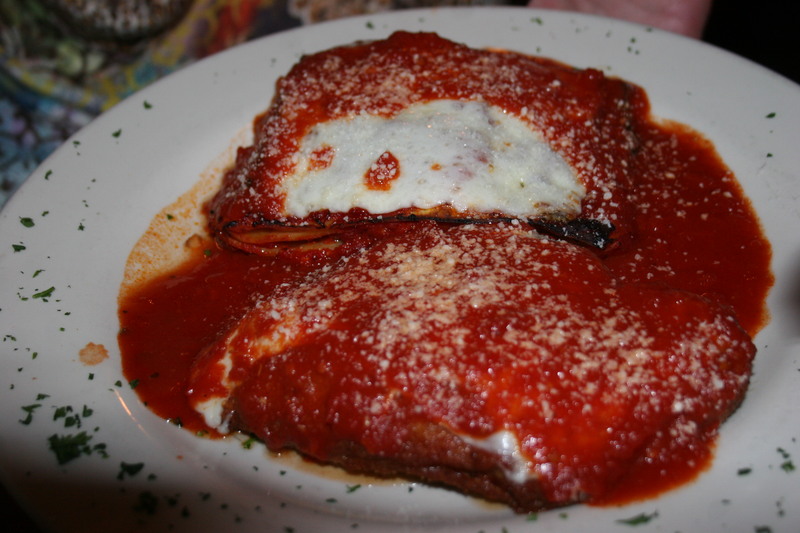 Kathy selected the combination of Chicken Parmagiana and Lasagna. Another massive portion which provided plenty for the present and another great meal for Monday evening. The entire bill with tax and tip was only $48.00. It reminded us of why we used to enjoy coming to Cotardo’s in the past and mystified us as to why it had been off our radar screen for so long. There are many nights when we dine out and spend twice as much for meals that were not as enjoyable. In fact, we returned to Cotardo’s last Saturday evening with friends and although I didn’t have my camera with me to show you all off the delicious entrees we shared (I had the Pasta Bersani, chicken and angel hair pasta, sauteed with garlic and oil, sun-dried tomatoes and a touch of marinara sauce). Another delicious dish this time the total per couple was $46.00. Hard to beat the prices and the food is first-rate. They don’t take reservations so grab your wine and head over to Blackwood early and if you do have to wait, it’s worth it.